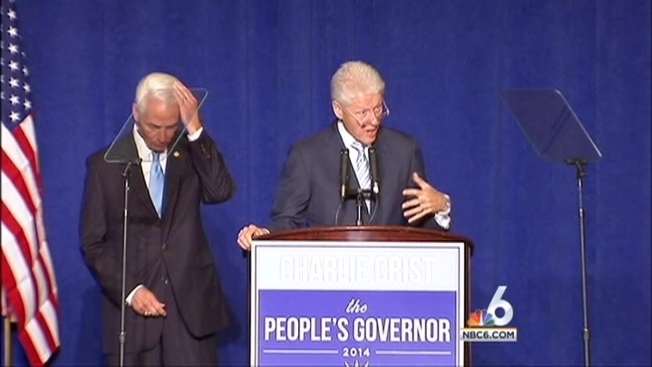 The political odd couple, former President Bill Clinton and former Florida Governor Charlie Crist, campaigned this year for the first time at a Miami rally Friday night. Clinton came to Miami to give Crist a boost as the former Republican governor is locked in a tight race with current Governor Rick Scott. Clinton implored the Democrats in the crowd to bring out the vote in the mid-term election. The combination of Crist and Clinton on stage comes more than a decade after Crist was very critical of the former president during his impeachment. Crist, at that time a Republican, called for Clinton to resign the presidency. However, as the Republican Party moved further to the right, Crist first became an independent before switching to the Democratic Party last year. Standing next to Crist Friday night, Clinton emphasized the former governor’s political change is for real. “He cut property taxes for seniors and the middle class and he worked to make our drugs more affordable,” Clinton told the crowd. The former president reminded voters that when Crist was in office, he extended early voting hours for the 2008 presidential election and enacted automatic restoration of voting rights for former non-violent felons, which Clinton noted Scott has since undone. Clinton focused on the vote noting that Scott and the GOP-controlled legislature enacted voting restrictions before the 2012 elections. Many of those restrictions ended up with long waits at precincts in Miami-Dade County. “For me, when somebody messes with the right to vote, I take it personally,” Clinton said to loud applause. Clinton also focused on Governor Scott’s vast campaign and personal wealth. Scott has already spent more than $25 million, with much of it portraying Crist as a “slick politician” and “lousy governor.” Clinton said Crist is the candidate who will protect the middle class. Crist not only has to battle Scott, but also has to convince some reluctant Democrats that he can be trusted as the party’s representative. At the Clinton/Crist rally Friday night, voters in the crowd liked what they heard from the former governor. “I think what President Clinton said is absolutely right, that the party left Charlie Crist, rather than Charlie Crist leaving the party,” said voter Joan Blank. Clinton’s appearance was the first of several high-profile Democrats that will stump for Crist. Massachusetts Governor Deval Patrick and Maryland Governor Martin O’Malley are both scheduled to appear with Crist later in the month. Democrats are focused on taking Florida ahead of the 2016 presidential election. Owning the governor’s seat in the nation’s largest swing state in the nation would give Democrats a way to push back on what they say is decades of conservative rule. Crist said while some of the work has been finished, there’s still plenty left to do.